It was just another day, breakfast, work, kids soccer practice …. Consider your own lives. How many of you are on auto-pilot? We all settle into routines, that is human nature. We are wired to make certain assumptions about our day to day life. To do otherwise would be overwhelming to our brains. 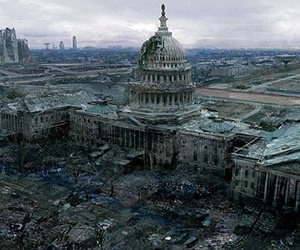 Then … the collapse event occurs … TEOTWAWKI – SHTF – DOOMSDAY – ARMAGEDDON … whatever label you choose. As preppers we face many threats. Pick your poison. Preppers recognize that our world is unstable and subject to disasters, both natural and man-made. We prepare for a number of different collapse events, most of which result in societal collapse. Recent events surrounding grand jury decisions in Ferguson, MO and New York remind us that the American psyche is becoming more and more polarized resulting in potential for large scale unrest. Once the SHTF, what happens next? I don’t mean weeks after. I mean what happens the day after the SHTF? What should you be concerned with in those initial hours and days after you realize life as you know it has changed, forever? The End Of The World As We Know It. It DOES NOT MEAN the end of the world. This is why we prep. We believe TEOTWAWKI means a catastrophic collapse event. Hurricanes, tornadoes and other natural disasters are SHTF events which can be “managed” as opposed to a total collapse event such as an electromagnetic pulse attack or a devastating coronal mass ejection. For more on the various collapse events of concern to preppers, read What is Your TEOTWAWKI? Once the threat level has been assessed as a result of the collapse event, get to steppin’. If you recognize any immediate shortcomings in your preparedness plan that come to mind, try to address it immediately. You will have a brief period of opportunity to gather additional prepper supplies while the sheeple stare at the TV in wonder and amazement. Contact other members of your prepper group. You should all have an action plan in place. Next, gather facts about the collapse event. Do you have access to information? What adjustments need to be made. Many believe that societal breakdown won’t occur for at least 72 hours. Depending upon where you live, I agree. But, if you are in an urban area, I suspect that 24 hours is more likely. Use Ferguson, MO as exhibit “A”. If you can’t defend it, it isn’t yours. 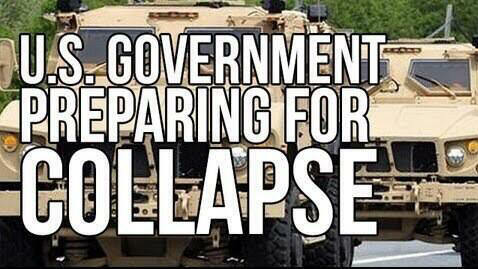 Our government is preparing for collapse, and not in a nice way. 1. Assess the threat level. 2. Act quickly to enhance your preps. 3. Gather your prepper group. 5. Beware your fellow man. Then, live long and prosper fellow preppers! 13 Comments on "It’s The Day After The SHTF, Now What?" Sheltering at home is the best idea as your already setup and living there. However being able to get up and go within 10 minutes is also necessary. Hello No Name Required! I see you already know how to practice OPSEC! The day of or day after SHTF, what would I do? Lock and load and then NOTHING ELSE. The first rule is to not panic. The second is to take your time and assess the situation. Sit back and first try to figure out what happened if possible because it will help you determine your moves. Let’s say it was an EMP.. You will want to find out because within days, Nuclear reactors are going to melt down and radiation is going to become an issue. This is just one example of taking a day or so and waiting to see what happens. Next, you are going to also need to take that same time to over not only the plans you should already have but to double check ALL of your equipment. If possible, I plan on also taking any and all cash I still have and buying anything I can get my hands on it because within hours it will be looted and gone once the masses figure out things are not normal..
Hi Malakie and thanks for reading our article on APN! You are in the one percent of Americans who will be astute enough to know that there is a real collapse event. Like you, I plan to act quickly to procure additional preps and then establish security around our home. Those first few hours before the sheeple realize what hit them will be opportunistic for you. I think the first thing I would do is heat water and make some coffee or tea; normalcy, even in small doses, helps in a state of insanity. Greetings Liberal Prepper and thanks for your comments on our article. Normalcy is important to keep our sanity. There will be plenty of time to establish a routine. In those early hours after the collapse event, we will procure additional preps, assemble our group and estsblish perimeter security. On the prepped boat, sail out. Open my HAM radio out of secure storage and listen, oh and have a nice cup of coffee:) If it’s real trouble, I think you’d be surprised how many deserted islands there are! I would be starving for information. I believe we all would after all it happened. We are bombarded with information every day. I mean I have ways to find things out aka shortwave ham etc etc. The more info you have the better you can plan, deal or prepare futher. I would also would be going through my preps like a mad man. In all truth it would take a couple days for me to settle down. I’m trying to be as realistic about myself as possible. It wouldn’t be full blown off the wall crazy but I know my mind would be in overdrive for a few days. Once again trying to be realistic about myself. Recognizing a SHTF situation is very important and should be considered in advance. Also, a SHTF event may very well lead to TEOTWAWKI. Many people think of a disaster as something that happens very quickly complete with large explosions and signs in the sky. Think about the fact that a disaster could take weeks to occur and may not be readily recognized as such. Think about driving home one afternoon and you notice that street lights are out, businesses are dark and traffic lights are not working. A solar EMP? Possibly and certainly a TEOTWAWKI event if worldwide. It’s time to go home, crank up your battery operated ham radio and find out what is happening outside your own community. It may be time to gather all your emergency cash for one last “normal” shopping trip. Or you might only need to crank up the grill and wait out the local power outage. Your actions during a disaster may very well be the difference between survival and death. Knowing what to look for and when to act are equally important. Nuclear war is pretty easy to recognize and definitely a TEOTWAWKI situation. The events which occur gradually should be watched closely. The day after? Looks like it’s getting closer every day, doesn’t it? I’ve been planning for years. Starting growing my own groceries, canning,reloading my own ammo, hunting and fishing for food. Okay, I’ve always hunted and fished. But now I’m doing it with purpose. At least that’s what I tell the wife anyway when she starts complaining about me never being home during hunting season. But I still feel woefully unprepared. So I guess the question to ask is can you ever be fully prepared for every SHTF scenario? Maybe so, but I think not. I believe the best thing that I did was to install a hand well pump made from PVC pipe in my well casing along with the electric pump. Great article BTW! Bobby, The decision to bug out or in is crucial as once things get really bad, the chances for moving safely from one place to another will be greatly reduced. One place this is discussed is on SHTF School which is run by a guy who survived the Bosnian war. He gives a lot of insight as to what happens in a war and how drastically some people change, many from being nice neighbors to becoming ruthless murderers in a matter of days. For me, I have concluded a BOL is the way to go as I don’t believe cities will be a healthy place to be after the SHTF. More specifically, between being at the mercy of the government for food, water, and security, then being prey to well armed gangs, criminals who will be released from prison, or your nice neighbor who turns rogue, I have decided bugging in is not for me. So prepare, evaluate, then prepare, and repeat. One cannot be overprepared but one can definitely be underprepared. And pray for America, for we need God’s help.